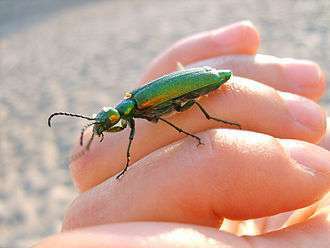 The "Spanish Fly", Lytta vesicatoria has been considered to have medicinal, aphrodisiac, and other properties. It contains an irritant chemical, cantharidin, which is certainly toxic. The roles of insects in culture include their use as food (entomophagy), in medicine, in science, for dyestuffs, in art, in music, in film, in religion, and in mythology. Some of these aspects have variously been labelled academically as cultural entomology, dealing mostly with "advanced" societies, and ethnoentomology, dealing mostly with "primitive" societies, though the distinction is weak and not based on theory. Both academic disciplines explore the parallels, connections and influence of insects on human populations, and vice versa. They are rooted in anthropology and natural history, as well as entomology, the study of insects. Other cultural uses of insects, such as biomimicry, do not necessarily lie within these academic disciplines. The Millennium Ecosystem Assessment (MEA) report 2005 defines ecosystem services as benefits people obtain from ecosystems, and distinguishes four categories, namely provisioning, regulating, supporting, and cultural. A fundamental tenet is that a few species of arthropod are well understood for their influence on humans (such as honeybees, ants, mosquitoes, and spiders). However, insects offer ecological goods and services. The Xerces Society calculates the economic impact of four ecological services rendered by insects: pollination, recreation (i.e. "the importance of bugs to hunting, fishing, and wildlife observation, including bird-watching"), dung burial, and pest control. The value has been estimated in the United States at $57 billion. As the ant expert E. O. Wilson observed: "If all mankind were to disappear, the world would regenerate back to the rich state of equilibrium that existed ten thousand years ago. If insects were to vanish, the environment would collapse into chaos." A Nova (TV Series) segment on the American Public Broadcasting Service framed the relationship with insects in an urban context: "We humans like to think that we run the world. But even in the heart of our great cities, a rival superpower thrives ... These tiny creatures live all around us in vast numbers, though we hardly even notice them. But in many ways, it is they who really run the show. The Washington Post stated: "We are flying blind in many aspects of preserving the environment, and that's why we are so surprised when a species like the honeybee starts to crash, or an insect we don't want, the Asian tiger mosquito or the fire ant, appears in our midst. In other words: Start thinking about the bugs." Steven Kellert classified public attitudes towards insects by 9 primary interests, namely aesthetic, humanistic, moralistic, naturalistic, dominionistic, ecologistic, negativistic, utilitarian, and scientific. Human attitudes toward insects are often negative, reinforced by sensationalism in the media. This has produced a society that attempts to eliminate insects from daily life. Nearly 75 million pounds of broad-spectrum insecticides are manufactured and sold each year for use in American homes and gardens. Annual revenues from insecticide sales to homeowners exceeded $450 million in 2004. Out of the roughly a million species of insects described so far, not more than 1,000 (about 1/10 of 1%) can be regarded as serious pests, and less than 10,000 (about 1%) are even occasional or sporadic pests. Yet not one species of insect has been permanently eradicated through the use of pesticides. Instead, at least 1,000 species have developed field resistance to pesticides. Entomophagy refers to the eating of insects. Many insects are considered a culinary delicacy in some societies around the world, and Frederick Simon Bodenheimer's Insects as Human Food (1951) drew attention to the scope and potential of entomophagy, but the practice is uncommon and even taboo in other societies. Sometimes insects are considered suitable only for the poor in the third world, but in 1975 Victor Meyer-Rochow suggested that insects could help ease global future food shortages and advocated a change in western attitudes towards cultures in which insects were appreciated as a food item. P.J. Gullan and P.S. Cranston felt that the remedy for this may be marketing of insect dishes as suitably exotic and costly to make them acceptable. They also note that some societies in sub-Saharan Africa prefer caterpillars to beef, while Chakravorty et al. (2011)  point out that food insects (highly appreciated in North-East India) are more expensive than meat. The economics, i.e., the costs involved collecting food insects and the money earned through the sale of such insects, have been studied in a Laotian setting by Meyer-Rochow et al. (2008). In Mexico, ant larvae and Corixid water boatman eggs are sought out as a form of caviar by gastronomes. In Guangdong, water beetles fetch a high enough price for these insects to be farmed. Especially high prices are fetched in Thailand for the giant water bug Lethocerus indicus. 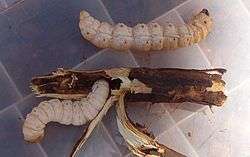 Insects used in food include mopani worms, silkworms, Maguey worms, Witchetty grubs crickets, grasshoppers and locusts. In Thailand, there are 20,000 farmers rearing crickets, producing some 7,500 tons per year. Maggot therapy uses blowfly larvae to perform wound-cleaning debridement. They secrete allantoin, which is used to treat the infectious bone disease, Osteomyelitis. Cantharidin, the blister-causing oil found in several families of beetles described by the vague common name Spanish fly, was accepted by the FDA in 2004 as treatment for warts and other skin problems. It was in Ancient Greece and Rome, and has been used as an aphrodisiac in some societies. Studies in cell culture and animal models have demonstrated tumour-fighting properties. Blood-feeding insects like ticks, horseflies, and mosquitoes inject multiple bioactive compounds into their prey. These insects have long been used by practitioners of Eastern Medicine to prevent blood clot formation or thrombosis, suggesting possible applications in scientific medicine. Over 1280 protein families have been associated with the saliva of blood feeding organisms, including inhibitors of platelet aggregation, ADP, arachidonic acid, thrombin, PAF, anticoagulants, vasodilators, vasoconstrictors, antihistamines, sodium channel blockers, complement inhibitors, pore formers, inhibitors of angiogenesis, anaesthetics, AMPs and microbial pattern recognition molecules, and parasite enhancers/activators. Ixolaris, a tissue factor inhibitor has been shown to block primary tumour growth and angiogenesis in a glioblastoma model. Arachnids have been used in traditional medicine, and their venom has been studied for bioactive factors. In 1993 Margatoxin was synthesized from the venom of the Central American bark scorpion, Centruroides margaritatus. This peptide selectively inhibits voltage-gated potassium channels. Patented by Merck, it has the potential to prevent neointimal hyperplasia, a common cause of bypass graft failure. Some hemipterans are used to produce dyestuffs, such as carmine (also called cochineal). The scale insect Dactylopius coccus produces the brilliant red-coloured carminic acid to deter predators. 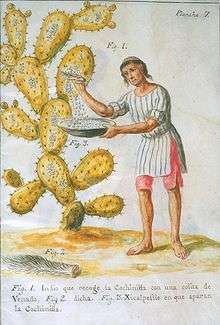 Up to 100,000 scale insects are needed to make a kilogram (2.2 lbs) of cochineal dye. The Namib desert beetle, Stenocara gracilipes, channels water from fog down its wings. Insect attributes are sometimes mimicked in architecture, as at the Eastgate Centre, Harare, which uses passive cooling, storing heat in the morning and releasing it in the warm parts of the day. The target of this piece of biomimicry is the structure of the mounds of termites such as Macrotermes michaelseni which effectively cool the nests of these social insects. The properties of the Namib desert beetle's exoskeleton, in particular its wing-cases (elytra) which have bumps with hydrophilic (water-attracting) tips and hydrophobic (water-shedding) sides, have been mimicked in a film coating designed for the British Ministry of Defence, to capture water in arid regions. Both the symbolic form and the actual body of insects have been used to adorn humans in ancient and modern times. 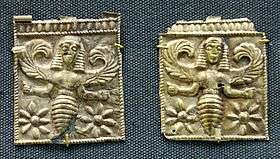 A recurrent theme for ancient cultures in Europe and the Near East regarded the sacred image of a bee or human with insect features. Often referred to as the bee "goddess", these images were found in gems and stones. An onyx gem from Knossos (ancient Crete) dating to approximately 1500 BC illustrates a Bee goddess with bull horns above her head. In this instance, the figure is surrounded by dogs with wings, most likely representing Hecate and Artemis - gods of the underworld, similar to the Egyptian gods Akeu and Anubis. "It's extremely important to understand planetary nebulae such as the Bug Nebula, as they are crucial to understanding our own existence on Earth ... Images like these are remarkable not only for their beauty but also for what they tell us about our own origins ... The cloud of dust and ice in the Bug Nebula contains the seeds of a future generation of planets." 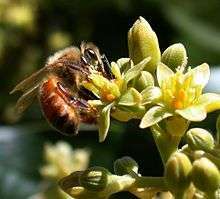 "
The honey bee played a central role in the cosmology of the Mayan people. The stucco figure at the temples of Tulum known as "Ah Mucen Kab" - the Diving Bee God - bears resemblance to the insect in the Codex Tro-Cortesianus identified as a bee. 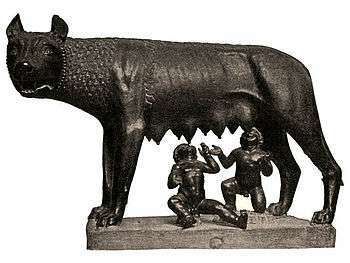 Such reliefs might have indicated towns and villages that produce honey. Modern Mayan authorities say the figure also have a connection to modern cosmology. Mayan mythology expert Migel Angel Vergara relates that the Mayans held a belief that bees came from Venus, the "Second Sun." 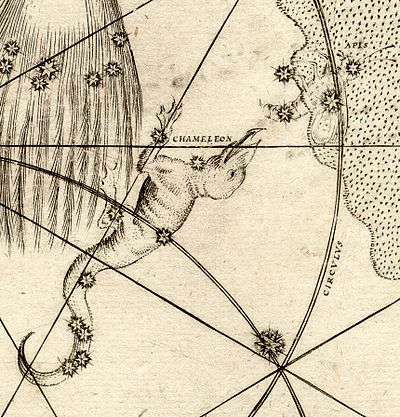 The relief might be indicative of another "insect deity", that of Xux Ex, the Mayan "wasp star." The Mayan embodied Venus in the form of the god Kukulkán (also known as or related to Gukumatz and Quetzalcoatl in other parts of Mexico), Quetzalcoatl is a Mesoamerican deity whose name in Nahuatl means "feathered serpent". The cult was the first Mesoamerican religion to transcend the old Classic Period linguistic and ethnic divisions. This cult facilitated communication and peaceful trade among peoples of many different social and ethnic backgrounds. Although the cult was originally centered on the ancient city of Chichén Itzá in the modern Mexican state of Yucatán, it spread as far as the Guatemalan highlands. In China, farmers often regulate their crop planting according to the Awakening of the Insects, when temperature shifts and monsoon rains bring the insects—in particular crickets—out of hibernation. According to custom, if the first thunder of the year happens on this day, it will bring good luck to the entire agricultural production year. But if the first thunder happens before this day, the following period will be rainy and the autumn harvest will be bad. Most "Awakening" customs are related to eating snacks like pancakes, parched beans, pears, and fried corn, all symbolizing harmful insects in the field. "To give them language was to simultaneously celebrate their difference and to doom them to impossibility, to condemn them to the merely imitative ... What foolishness to judge insects - so ancient, so diverse, so accomplished, so successful, so beautiful, so astonishing, so mysterious, so unknown - by criteria they can never meet and about which they could not care. What silliness to disregard their accomplishments and focus instead on their supposed deficiencies!" There is a common misconception that cockroaches are serious vectors of disease. Cockroaches are not vagile, i.e. 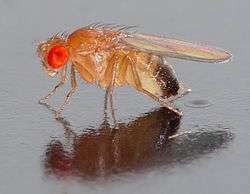 they do not travel far from their birthplace as opposed to the housefly which may travel miles from its birthplace. The cockroach will spread its GI tract contents throughout a building. If that is a home it will be helping to spread the diseases that the family and friends bring into the home. In a hospital or a restaurant it can spread diseases from sick to well individuals. They have no bite or sting. It is true that by external contact that cockroaches can carry bacteria such as salmonella onto surfaces. Their shells contain a protein, arylphorin, implicated in asthma and other respiratory conditions. ↑ Lyman Kirst, Marian (29 Dec 2011). "Insect - the neglected 99%". High Country News. Retrieved 22 July 2012. ↑ Meyer-Rochow, Victor Benno (1975). "Can insects help to ease the problem of world food shortage?". ANZAAS Journal: "Search". 6(7):: 261–262. 1 2 Gullan, P. J.; Cranston, P. S. (2009). 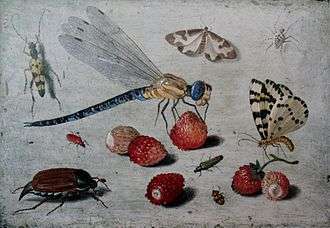 The Insects: An Outline of Entomology. John Wiley & Sons. pp. 9–13. ISBN 978-1-4051-4457-5. ↑ Carneiro-Lobo, T.C., Konig, S., Machado, D.E., 2009. Ixolaris, a tissue factor inhibitor, blocks primary tumor growth and angiogenesis in a glioblastoma model. J. Thromb. Haemost. 7, 1855e1864. ↑ E. M. Costa-Neto, An. Acad. Bras. Cienc., 2005, 77(1), 33–43. ↑ Gullan, P.J. ; Cranston, P.S. (2005). The Insects: An Outline of Entomology (3 ed.). Oxford: Blackwell Publishing. ISBN 1-4051-1113-5. ↑ Rothman, Sheila; Rothman, David (2011). The Pursuit of Perfection: The Promise and Perils of Medical Enchancement. Knopf Doubleday. pp. 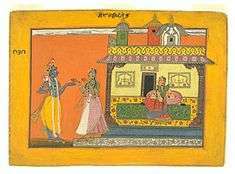 49–. ISBN 978-0-307-76713-4. ↑ "Rimsky-Korsakov - The Flight of the Bumblebee (Homeschool Music Appreciation)". Retrieved 21 August 2012. ↑ ""Eric Speed, Violinist, Flight of the Bumblebee, Nikon S9100, Montreal, 22 July 2011".". Retrieved 2012-04-21. ↑ "The Honey Bee". Retrieved 26 July 2012. ↑ Frisch, Karl von (1956). Bees; their vision, chemical senses, and language. Cornell University Press. ↑ Raffles, Hugh (2010). Insectopedia. Pantheon Books. p. 200. ↑ Roth, L. M., and E. R. Willis. 1960. 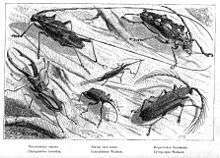 The biotic associations of cockroaches. Smithsonian Misc. Collect. 141:1–470. ↑ "What are Cockroaches?". Retrieved 21 August 2012. ↑ "What are the cockroach asthma antigens?". Curr Opin Pulm Med. 7: 14–9. Jan 2001. PMID 11140401. Meyer-Rochow, V. B.; et al. (2008). "More feared than revered: Insects and their impact on human societies (with specific data on the importance of entomophagy in a Laotian setting". Entomologie Heute. 20: 3–25.